As the winter closes in, Pakistan's earthquake survivors are facing their toughest challenge since the disaster struck. Many are still without shelter, adequate medical attention and food. Yet a UK doctor recently returned from an eight-day mercy mission in the region, warns that the west is starting to forget the plight of the four million people left homeless after the quake. Swee Ang, a consultant orthopaedic surgeon at Barts and the Royal London, warns that - without an increase in western aid and medical expertise - many will not survive the winter. She said temperatures are dipping as low as -5C five at night, but that over 70% of the tents sent to the region are not appropriate for winter conditions 5,000 feet up in the Himalayas. "The situation is disastrous. I think initially everybody wanted to respond, but people seem to have forgotten it now. And now that the winter is starting to bite, they really need help." She said there were too few medical personnel in the area and that conditions for those who were there were very basic. 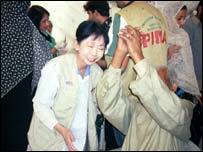 During the eight days she was in the field, Swee Ang was unable to shower because it was too cold. But she said volunteers should not let this deter them. "There is also a huge need for experienced doctors and nurses. The conditions are basic. Volunteer medics are put up in tents. There are communal washing areas but no hot water. "However, the smiles on the faces of the patients make up for any hardship you endure. I would urge anyone who thinks they may have something to offer to consider travelling out there for just a week or so to help out." She went to Pakistan with a colleague, consultant plastic surgeon Hasu Patel. They travelled to Bagh, a region to the north of the country, and said they had been horrified by the sights that greeted them. Dr Ang said: "Nothing can prepare you for what you see when you arrive in Bagh. Some of the most beautiful scenery in the world gives way to utter devastation. "An entire region has been destroyed." 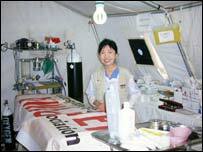 She and her colleagues, who worked for the Malaysian charity Mercy, were based in a field hospital situated in a series of tents on the site of a school, which was flattened by the quake, burying hundreds of pupils and their teachers. Both surgeons paid their own travel expenses. They also teamed up with another plastic surgeon at The Royal London Hospital, Mr Ghassan Abu-Sitta, to raise £30,000 to pay for a portable X-ray machine for the field hospital. Staff at The Royal London also raised £1,000 to pay for tents suitable for winter conditions, blankets and crutches. Miss Ang said conditions in Pakistan were rough and ready, with the basic procedures carried out in the tents and the most serious cases being flown to the capital for treatment. The team had basic medical supplies, and equipment had to be boiled to sterilise it. They also used household disinfectants to make things sterile. She said they dealt with about 40 new cases each day, many of whom are still nursing their original injuries from the quake, nearly six weeks earlier. Miss Ang said they were able to give patients treatment for their fractures, put limbs in plaster and carry out much needed physiotherapy on the old injuries. "They were in a tremendous amount of pain although you would not know it to talk to them. Others had serious infections and wounds which needed skin grafting." They also spent some time immunising local children against common childhood infections such as measles. But she says the thing that struck her most about the Pakistani people was their stoicism. "The people we met were truly amazing. They are very strong, very stoical. They were also remarkably calm and polite. "We met some wonderful children. They had beautiful faces. You wouldn't know it to look at them that they had lost their entire family."